This is a liquid shoe polish, the way I remember white shoe polish being years ago. Hoffco Shoe Dressings contain only the finest waxes and quality ingredients, including lanolin, to preserve and condition your shoes--as they beautify. Hoffco is rub-resistant and recommended for childrens shoes. It comes in 3 colors, White, Bone, and Vanilla Ice and works well in covering scuffs. This polish also works very well on skates. 4 oz. bottle Contain Lanolin and carnauba wax. Harri Hoffmann Company Manufacturing Quality Leather Care Products for more than 50 years! For more than 50 years the Harri Hoffmann Company has manufactured high quality shoe polish and leather care products. 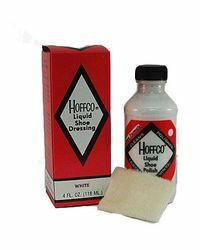 Our first bottle of White Stain Hoffco brand shoe polish was sold on April 6, 1951. Almost immediately afterwards customers realized the difference Hoffco shoe polish made on the finish of their shoes and demand increased. 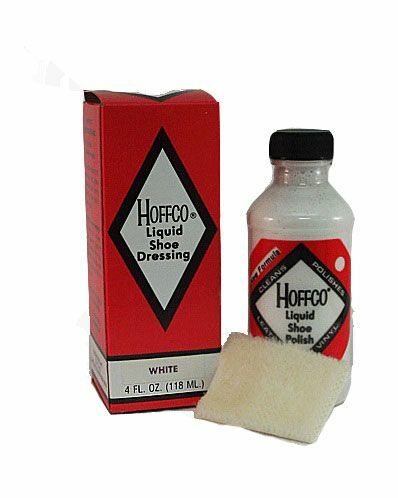 Within a few years the number and variety of Hoffco shoe care products grew greatly. Fifty years and millions of bottles later, The Harri Hoffmann Company continues to manufacture shoe and leather care products both under its own brands as well as dozens of private label products. Great service and price, all sales should be this easy.